Imagine that you are getting on a tube and following the river flow on the tube under a mystical cave. It must be such extraordinary experience, isn’t it? When you take a Jogja sharing tour to Kalisuci Cave, it won’t be something impossible. Kalisuci Cave is basically a tourism attraction that gives you a chance to explore an underground river by getting on a tube. Cave tubing becomes the highlight of this attraction. 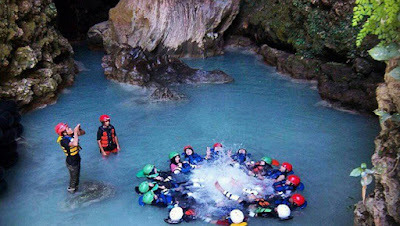 It is generally a combination of body rafting and caving. Kalisuci Cave is located in Semanu, Gunung Kidul Regency of Yogyakarta. From the downtown of Yogyakarta, the location is about 60 kilometers away. It will take around one hour and a half to reach the location by car. It is safe to say that this tourism attraction offers some uniqueness which may not be discovered in other locations. Here are some of them. First, you will get a chance to witness such wonderful stalactites which keep emitting water and showcase a crystal-like color. There are two types of river flow that you can experience during the journey: the close river and open river. Both offer different scenery that will keep you in awe. From the moment you enter the cave and go out from the cave, you will be able to see such cool and beautiful row of karsts hill that you won’t forget. Nowadays, it is very easy to find a Jogja sharing tour that offers you a tour package to explore Kalisuci Cave. It is actually a nice choice especially if you don’t want to be bothered by transportation and direction to the location. The tour package usually includes a pick-up service to your hotel, an English speaking driver, local guide and more. In other words, you just need to book and have fun later on. Then, before you go for the cave tubing, there are some tips that you better take a peek first. So, here we go. There will be some lockers available for visitor. Here, you can use it to leave your clean clothes and bags safely. Next, it is recommended for you to bring extra clothes since you will get splash by the water. Wear comfortable clothes too for the activity. Then, remember that you may need to have waterproof bags with you in case you want to carry your mobile phone or camera along the journey. So, are you ready to take a brand new adventure of breathtaking cave tubing in Yogyakarta? If you are ready for such adventure, go and visit www.jogjabromotour.com to find the best tour package for your trip. Here, you can also find other wonderful tour packages to explore most beautiful sights of Indonesia. Therefore, what are you waiting for?